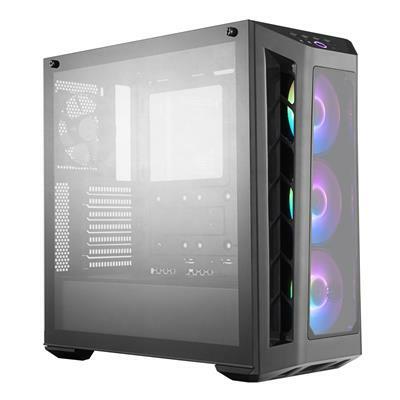 Special Features: 3 Tempered Glass Panels - The front and side panel offer a clear view of the front fans and system configuration, while the panel behind the motherboard is patterned tempered glass to hide the open side of the PSU. ‚Addressable RGB Fans - Three pre-installed 120mm addressable RGB fans behind the front panel compliments components for a comprehensive lighting system‚ARGB Lighting Control - Sync the addressable RGB lighting on the power button and fans by connecting the ARGB cable from the I/O panel to the included 2 to 3 ARGB splitter. Certified compatible with: ASUS, Gigabyte, MSI, and ASRock motherboards for a comprehensive lighting system.‚Support for a total of 6 fans and water cooling - Six 120mm fans and front, top and rear water cooling support ensure that you don't have to compromise on performance.‚Cable Cover and Routing Space - A PSU shroud, cable cover, and 18~25mm width of space behind the motherboard provides options to keep systems clean; GFX cables can also be routed directly through the PSU shroud rubber grommet.‚Graphics card support up to 410mm - Ample graphics card clearance provides a high potential for upgradeability.‚Aggressive Intakes - Large intakes on each side of the front panel feed air to cool the interior.